Rated as the #1 movie of all time by IMDB, the Shawshank Redemption is a timeless classic about Andy Dufresne (Tim Robbins) who epitomizes the result of undying hope in a direly hopeless situation. An integral part of the story is the tale of Brooks Hatlen (James Whitmore), an aged convict who is heavily institutionalized having spent most of his life behind bars. Shortly after being released into a brave new world, Brooks decides he's had enough and carves out his final signature in the small hotel room he now resides in, writing "Brooks was here" in a quiet and serene moment. Then, using the same chair to get to the inscription, he kicks off it, hanging himself to death. 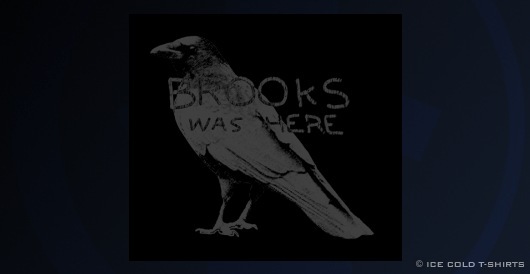 Integrated with the quote is Jake, Brooks' pet crow who is symbolically raised within Shawshank and freed by Brooks, though he has lost the power to free himself. The film also stars Morgan Freeman as Red, Andy's best friend in prison. Crow derived from media under license from Shutterstock.